ICH Blog: Heritage Foundation promoting heritage places and youth creativity. Heritage Foundation promoting heritage places and youth creativity. Students, it’s time to get creative! 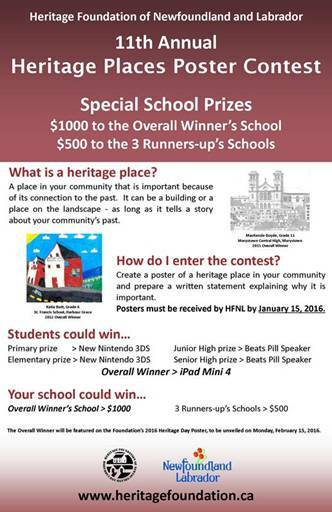 The Heritage Places Poster Contest is currently running in all schools in the province. It is organized through the Heritage Foundation of Newfoundland and Labrador (HFNL). To participate in the contest, students must create an original piece of art depicting a building, structure or landscape that has heritage value in their community. They must also submit a short written statement explaining its heritage value. Prizes are awarded at the primary, elementary, junior high and senior high levels. An overall winner is chosen from these category winners. 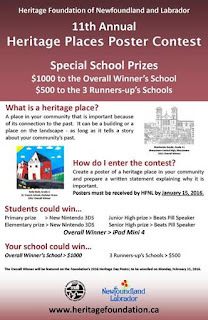 The winning artwork will be featured on HFNL’s 2016 Heritage Day poster in February. Contest guidelines and entry forms can be found on HFNL’s website at www.heritagefoundation.ca, by calling 1-866-739-6592 extension 4 or by emailingandrea@heritagefoundation.ca. Contact information: For more information, please contact Andrea O’Brien by calling 1-866-739-6592 extension 4 or by emailingandrea@heritagefoundation.ca.